As the first annual Niagara Wine has progressed it has been interesting to see and experience the reactions of the tasting room staff when I announced my intentions. So far the week has seen: Tawse, Malivoire, Strewn, Stratus, Angel’s Gate, Fielding, De Sousa, Coyote’s Run and Henry of Pelham visited. Each reaction has been different, some have been skeptical in the “oh what do you want for free” (despite the definitive statement that whatever wine they choose, 2 bottles will be purchased). Some have been overwhelmed by the task and others have taken it in stride and gone into the good and glory of their vineyards. It was the visit to Henry of Pelham so far that has been the rock star of visits. While almost every other stop has been an excellent experience, this one was above and beyond. It actually started on a sour note with the Coach House not being open for lunch (my fault for not checking), but as is often the case we made lemonade from lemons and skipped lunch to do tastings. If you know nothing about Henry of Pelham or the Speck family, I highly suggest you follow this link to get some background on both. Heritage is important at the winery and you can sense it from the staff. We seemed to get lucky on Tuesday and we had two people look after us, primarily Viktoria with an assist from Trudy. With tremendous knowledge they led us through the ins and outs of almost all the wines produced at the vineyard. As we progressed from the sparkling through the whites and on to the wide selection of reds it was easy to see why past visits were as much fun as this one. Viktoria followed up her brilliant first act by taking us on a tour of their classic methode production areas, both of which shed light on the up to 30 month process used to make the wine we are about to discuss. Speaking of which, let’s move on to this non-vintage (NV) sparkling rosé. This wine has been crafted using Chardonnay and Pinot Noir grapes. It was crafted using méthode traditionnelle or classic methode (in fact there are many ways to describe it) which composes of two fermentations: first is done in the normal manner then the wine is bottled and a secondary fermentation is done inside the bottle, thus creating and trapping the carbon dioxide in the bottle. Once this fermentation is complete, this wine in particular is aged on the lees (expended yeast) for 30 months. So what does all this mean? For most, not much, you either like Champagne styled wine or you do not. If you are on the fence then this is an excellent wine to jump in with. 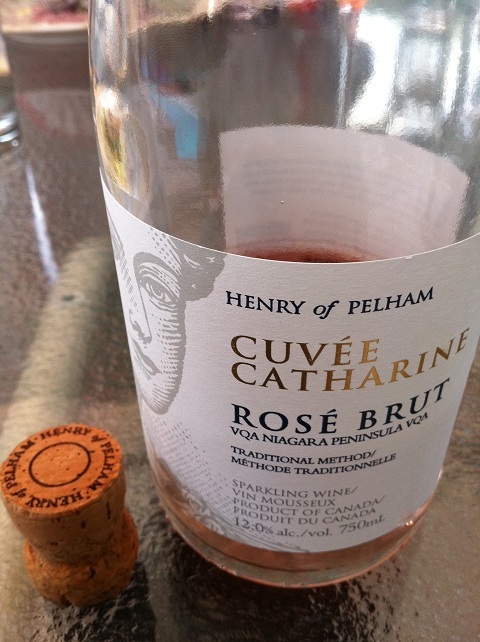 Cuvée Catherine is a very good offering, it has crispness, it is clean and it has the right amount of effervescence. The nose is neither overwhelmingly fruit nor sweet yet it has a good solid flavour. Overall this is an impressive selection by Viktoria, with Henry of Pelham most would have thought a premium Baco Noir or Speck Family Reserve wine would have been suggested, but she decidedly pointed to this pink beauty. I highly recommend grabbing a few for the next dinner party or special occasion, you will look smart and oenophile like when you bring this well-priced at $30. The CWG subjective rating is 89 out of 100. This entry was posted in Canadian, Wine and tagged canadian wine guy, henry of pelham, wine review. Bookmark the permalink.